Inflammatory bowel diseases (IBD’s), such as ulcerative colitis (UC) and Crohn’s disease (CD), are autoimmune conditions where your immune system attacks your own intestines. It’s thought that there’s no cure for such diseases, so all you can do is try to stay in remission for as long as possible between attacks. But can a plant-based diet help to both prevent and treat these debilitating conditions? This is a complex topic, so it has been covered in three parts. This is part 3 of 5. In a documented interview13 with the IMCJ, Dr Alan Goldhamer, another internationally-respected expert in fasting, discusses the benefits of this method in dealing with inflammatory disease and diseases of dietary excess. In the following video14 “Prolonged Water Fasting Q&A Dr. Alan Goldhamer”, Dr Goldhamer goes into more detail on why fasting works, dealing with its positive influence on microbiota, hypertension and other chronic diseases. A low-residue diet was often recommended for the management of an acute flare up of IBD, especially in patients with intestinal strictures or narrowing. Although the low-residue diet can be prescribed for short-term use, in clinical practice, patients often followed the diet long-term. The primary purpose of a low residue diet is to reduce the frequency and volume of stools and reduce the risk for intestinal obstruction, usually in preparation for colonoscopy, so that nothing obstructs the camera’s internal view. In the literature, there have been discrepancies as to the actual composition/definition of low-residue and low-fibre diets. A low-residue diet requires the elimination of whole grains, legumes and all fruits and vegetables (except for bananas and skinless potatoes), dairy and fibrous meats.16 This is not the same as a low-fibre diet which excludes only insoluble fibre. A 1985 prospective study17 in subjects with active CD compared a low-residue diet to an unrestricted diet. It found no differences in outcome including symptoms, need for hospitalisation, need for surgery, new complications, nutritional status, or postoperative recurrence. 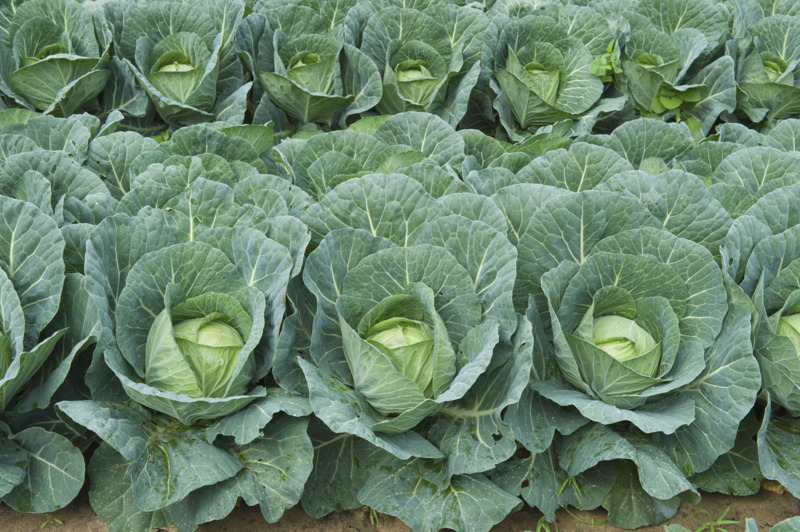 The side-effect of reducing residue/fibre in the colon is that there is then little or no “food” for the gut bacteria – and this should be a great cause of concern if maintained for a medium- to long-period of time. We saw the importance of gut microflora (microbiota) in part 2. Manipulation of the gastrointestinal microbiome through diet interventions, in attempt to reduce systemic inflammation, is increasingly recommended as adjuncts to ongoing medical therapy. The Anti-Inflammatory Diet (IBD-AID) is a nutritional approach designed to address nutrient adequacy, malabsorption and symptoms . A 2014 study 26 emphasised: “…the importance of dietary manipulation as an adjunct to the limited existing management options for IBD…” And that the study of the IBD-AID: “…would benefit from the rigorous analysis provided by a randomized clinical trial, with evaluation of mucosal healing and assessment of change in gut flora to examine the exact mechanism(s) of benefit.” More research is, of course, needed in order to persuade doctors to look further than the poorly-performing current methods. IBD-AID restricts the intake of particular carbohydrates (lactose, refined and processed complex carbohydrates), includes the ingestion of pre- and probiotic foods, and modifies dietary fatty acid intake specifically decreasing the total fat, saturated fats, the elimination of hydrogenated oils, and encouraging the increased intake of foods rich in n-3 PUFA (omega-3). A randomised control trial 33 in CD where subjects were instructed to consume a high fibre diet, including consumption of whole wheat bran cereal (1/2 cup daily) and restrict refined carbohydrates, reported improved health-related quality of life as measured by the Inflammatory Bowel Disease Questionnaire (IBDQ) 34 . Significant improvements were seen in the clinical disease activity scores, as measured by partial Harvey-Bradshaw index (pHBI) – see chart below. A much larger sample size, over a longer term, including subjects receiving a variety of medications, is needed to verify the results of this study. The above pHBI Graph measures CD symptoms (general well-being, abdominal pain, and liquid stools). This graph shows the results of the above study, namely that the high fibre (bran) treatment group and the control group mean scores were close at baseline. Mean scores for both groups dropped during the first week, the intervention group dropping more steeply. 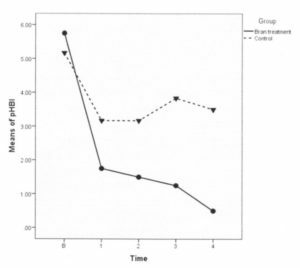 From week 1 until the end of the study, the control group means did not drop further and in fact increased slightly. All participants in the high fibre group scored a ‘zero’ on the pHBI at week 4. Taking psyllium (also known by the trade name Metamucil) is not something that I would recommend. Eating prunes (dried plums) has been shown to be much more effective. 35 36 37 38 39 40 Watch this video 41 by Dr Michael Greger for further details on the latter research. A randomised control trial 42 in subjects with UC in remission comparing psyllium fibre versus mesalamine (a 5-aminosalicylic acid which is an aminosalicylate anti-inflammatory drug used to treat IBD) versus psyllium fibre plus mesalamine reported continued remission at 12 months and slightly lower relapse rates in the mesalamine plus psyllium fibre group. Probability of continued remission was similar between all three groups. A 1991 randomised control trial43 with UC in remission over four months found psyllium to be superior to placebo in relieving gastrointestinal symptoms , especially for diarrhoea and constipation. A 2017 report44 states that only: “…weak evidence suggests that psyllium fibre may be efficacious in maintaining remission in UC. So, as stated above, my personal suggestion is to follow what Gr Greger suggests – eat real wholefood! Germinated barley foodstuff is an insoluble dietary fibre made by milling and sieving brewer’s spent grain 45 . Germinated barley foodstuff has prebiotic [a.] properties, containing glutamine-rich protein and hemicellulose-rich [b.] fibre which has been shown to reduce clinical activity and prolong remission in UC. [a.] Prebiotic food ingredients induce the growth or activity of beneficial microorganisms which can alter the composition of organisms in the gut microbiome). [b.] Hemicellulose is any of a class of substances which occur as constituents of the cell walls of plants and are polysaccharides of simpler structure than cellulose. [c.] CRP (C-reactive protein) is a substance produced by the liver in response to inflammation. A high level of CRP in the blood is a marker of inflammation. A similar designed study46 found that 20 grams of germinated barley foodstuff reduced levels of TNF-α [d.], IL-6 [e.] and IL-8 [f.], with significant reductions in IL-6 nd IL-8. Length of remission has also been prolonged with long-term administration (12 months) of 20 grams of germinated barley foodstuff . Germinated barley foodstuff appears to be a safe and effective maintenance therapy to prolong remission in patients with UC. [d.] TNF-α (Tumour necrosis factor) is a cell signalling protein involved in systemic inflammation. [e.] IL-6 (Interleukin 6) is interleukin (any of a class of glycoproteins produced by leucocytes for regulating immune responses) that acts as both a pro-inflammatory cytokine (cytokines are a broad and loose category of small proteins that are important in cell signalling). and an anti-inflammatory myokine. (a type of cytokine). [f.] IL-8 (Interleukin 8) is a chemokine (a small cytokine, or signalling protein ) produced by macrophages (mobile white blood cells) and other cell types such as epithelial cells (one of the four types of cells from which animal tissues are constructed – epithelial, nervous, muscle, and connective), airway smooth muscle cells and endothelial cells (specialised epithelial cells lining blood vessels.). Endothelial cells store IL-8 in their storage vesicles. I do not recommend this diet, partly because of its inclusion of many foods that a WFPB diet would avoid. However, I have included it because there is some research showing positive effects in relation to IBD (UC & CR). The paleo (or Palaeolithic) diet56 is another popular diet amongst patients with IBD. It recommends avoidance of processed food, refined sugars, legumes, dairy, grains and cereals, and instead it advocates for grass-fed meat, wild fish, fruit, vegetables, nuts and “healthy” saturated fat. 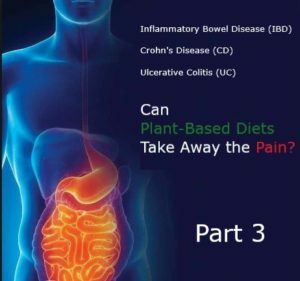 While it makes sense that a diet that promotes avoidance of refined and extra sugars and processed energy dense food would have health effects, I have not found any peer-reviewed clinical trials that have examined the efficacy of this diet for IBD. The only source57 I could find that advocates the paleo diet for CD appears to have link that do not work and bases its hypothesis on one undocumented case study. “It might be reasonable to assume our nutritional requirements were established in the past, but why the Paleolithic period? Why only the last two million years of human evolution? We have been evolving for about 20 million years since we split off from our last common great ape ancestor, during which time our nutrient requirements and digestive physiology were relatively set and likely little affected by our hunter-gatherer days at the tail end. So what were we eating for the first 90 percent of our time on Earth? What the rest of the Great Apes were eating: more than 95 percent plants. Indeed, for the vast majority of our evolution, it appears we, like our Great Ape cousins, ate primarily leaves, stems, and shoots (in other words, vegetables), and fruit, seeds, and nuts. In modern times, populations where many of our deadliest diseases were practically unknown, such as rural China and rural Africa, were reportedly eating huge amounts of whole plant foods, up to 100 grams of fiber every day, which is what researchers have estimated our Paleolithic ancestors were getting…today in the United States, we tend to get fewer than 20 grams of daily fiber, which is about half the minimum recommended intake and only one-fifth the amount of rural Chinese and Africans, and our Paleolithic ancestors. Advocates of the Paleo diet are certainly right in railing against the consumption of dairy and refined, processed junk, as well as encouraging high fruit, nut, and vegetable intake, but do they fail in promoting excess meat-eating, particularly products that bear little resemblance to the flesh of prehistoric wild animals? A review published in Meat Science [ 59 ] , for example, catalogued the laundry list of contaminants, including arsenic, mercury, lead, cadmium, and veterinary drugs such as antibiotic residues. Naturally, supplementation is a method that makes sense if “proper” food is not being consumed at all (as in the Modulen IBD diet), but to make the assumption that individuals with IBD (UC or CD) should consider using this casein-based drink in place of trying a balanced WFPB diet is, in my opinion, questionable at the very least. For those who for medical reasons either cannot or have been advised should not consume any solid food, it is clear that supplementation in some liquid form would be necessary. At this stage, I have not come across research comparing fortified liquid drinks such as Modulen with smoothies/drinks made with whole foods. This would be an interesting area of research to follow. demonstrate that this form of supplementation of fragmented foods elements is more effective than plant-based alternatives in achieving optimal health in humans. Whilst the MedD is not ideal, since it is not a non-SOS WFPB diet, evidence67 suggests that its increased emphasis on fresh fruits and veg, nuts and seeds and reduced animal and processed food intake (as compared with the SAD – Standard American Diet) results in a reduced incidence of IBD, including CD and UC. Research in 2014 confirms that elements of the the MedD are associated with significant improvements in health status in general, with the researchers concluding that “High adherence to a MD [MedD] is associated with a significant reduction in the risk of overall cancer mortality (10%), colorectal cancer (14%), prostate cancer (4%) and aerodigestive cancer (56%).” 68 . Since colorectal cancer is strongly associated with UC, it makes sense that elements of the MedD will also be good for preventing UC which, in turn, may prevent the development of cancer. A precise definition of the MedD is something that’s worth establishing when deciding whether benefits are actually to be found in the current 21st Century versions . Having spent some time living next to the Mediterranean, I can vouchsafe that the once-relatively healthy MedD (as it may have been in previous decades and centuries) is almost unrecognisable in the day-to-day diets of many individuals currently living in Mediterranean countries. A 2010 study 72 made it clear that childhood cases of IBD were rising at an alarming rate. Astonishingly, research back in 197587 showed that up to that year, only 18 cases of UC had ever been reported in the whole of the black populations of sub-Saharan Africa. In part 4 of 5 we will look at the the Harvey-Bradshaw Index & CD, one of the tools used for monitoring CD symptomatic responses when selectively removing and then reintroducing sensitive foods to the diet. CD is a chronic inflammatory disease of unknown cause, although there are theories: one theory suggests an abnormal immune response to gut bacteria; another suggests processed foods or recently emerged allergens may be responsible; additionally, there appears to be a genetic factor (gene NOD2) running in families.89 Other causal factors may include certain viral or bacterial infections, ethnicity, smoking and even the use of a treatment for acne scars (isotretinoin – although there are strong objections90 to this drug being responsible).